Who is Jin Tae Hwang? (bio, photo, etc.) Jin Tae Hwang, Sa Bom Nim is a cousin of the current Kwan Jang nim. Why is he significant in the Moo Duk Kwan history? He is Dan Bon #11, and was a student of the Founder. 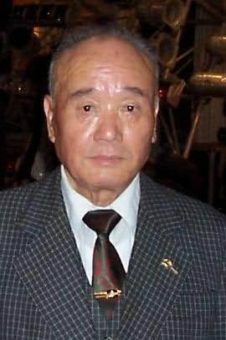 As lawyer in South Korea, during the Korean War, Jin Tae Hwang, Sa bom Nim, defended the Founder during a legal hearing where the Founder was accused of working with the Communist North Koreans. Sandra Schermerhorn: This is Sandra Schermerhorn. It's August 10th, 2006 and I'm in San Diego, California, USA, talking with Jin Tae Hwang and our interpreter is John Trabamien [ph?]. And your current residence and dan number? Sandra Schermerhorn: All right, we're back on. Now, about his history in the martial arts. When did he start training in the martial arts and where was he? Interpreter: I lived with the ______________ before even Moo Duk Kwan started. 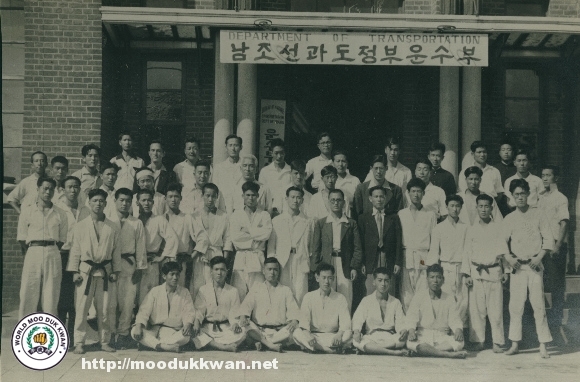 So that's where we began Moo Duk Kwan was _____________ in Seoul. Sandra Schermerhorn: Yes, how old was he when he started training? Sandra Schermerhorn: Nineteen, and did he train in a class with people, or just with the founder? Interpreter: It depend, because he lived with The late Kwan Jang Nim [ph?] and if there's class he was with a group. Sandra Schermerhorn: What was class like? Interpreter: When we began to train, the facility of Do Jam [ph?] was very, very poor. So everybody had the challenges to train. The circumstance was after they free from Japanese occupation. So everybody had a difficult situation to train and endure the circumstance. Sandra Schermerhorn: Okay, is there anybody else in his family who trained with him? Interpreter: No, I was only 19 so I didn't have family then. So I was _______________ my family. Interpreter: I lived with the late Kwan Jang Nim since I was little. Sandra Schermerhorn: Oh, since he was a child. Interpreter: Yes, and he was with the family too. Sandra Schermerhorn: When they had classes, Tae, tell me something about the class. Like, they did they train inside or outside? Were the classes long? Interpreter: When we began, we rented the abandoned building hourly, so it's not the whole day thing. So since we were a very small group, the Late Kwan Jang Nim had to borrow an abandoned building just for lunch hours. That's how we trained. Sandra Schermerhorn: On their lunch hour. Okay, did they train every day? #14 is Jin Tae Hwang Sa Bom Nim, directly behind the Founder, Hwang Kee. Interpreter: Every day except Saturday and Sunday, but the class, beside the class everybody trained at home where they can train. So that's not included in class. So it's much more vigorous training by every individual. Sandra Schermerhorn: When in the class, was it all mostly young men? Did women or children train? Interpreter: It's early twenties mostly, but no women, and mostly the railroad employees utilized their lunch time frame. Sandra Schermerhorn: And he worked on the railroad also? Sandra Schermerhorn: That was his job? Interpreter: In the beginning, only the railroad employees, the transportation actually at that time, little boys did on the train. That's how they started. Sandra Schermerhorn: I see. Now, how vigorous was the training? Like did they condition their hands for breaking? Interpreter: The early days, we just trained the basics. Only basics for a year and then after all the basics training and then after get a different belt, and the training differs. But in the beginning part, a year, it's just basic, just like elementary school is basic, went to next grade. It adds up more subjects, that's how our training was then. Interpreter: It's not like these days where there are several hundred people. In the early days because they have only few and because it's different rank, all the basics do together and the class structure was certain amount of class percentage is all basics together. And after that, you know, different ranks were practiced different form requirements, and different rank for the various rank practiced their required _____________, or one step sparring. Sandra Schermerhorn: Oh, they did one step sparring too? What was sparring like? Interpreter: We didn't spar right away. The Late Kwan Jang Nim had to watch and see if we can, who was ready and who was not ready, and the people who is ready to spar, and then we'll have sparring class. And as now, same as now, we did have a control sparring. Sandra Schermerhorn: Oh did they? Sandra Schermerhorn: But no equipment? That's a very new thing isn't it? Interpreter: No, just bare fits. Sandra Schermerhorn: How about Chok Pa [ph? ], breaking, what did they do? Interpreter: The Moo Duk Kwan is well known for Chok Pa in Korea. The Chok Pa part, any martial art demonstration, Moo Duk Kwan practitioner always wanted to demonstrate the very artistic Chok Pa demonstrations. Sandra Schermerhorn: What kind of techniques did they use? Interpreter: Usually hand techniques, mat and strike, and then fist, and then _________________, sidekick. Very simple like that. Interpreter: And also elbow strike. Interpreter: Quon so was very popular. Interpreter: These days I don't see Quon su and they use elbow. Sandra Schermerhorn: Yes, sir, they do. What does he like to break? What's his favorite? Interpreter: Chung Quong [ph? ], fist. Sandra Schermerhorn: And what did they break, boards? Interpreter: Red bricks, usually red bricks. Interpreter: Usually red bricks, usually for the stone, and roof tile at some point. They used to use the roof tile for Chung Quong and used red bricks for Soo Do, mat and strike. Interpreter: The Kwan Soo [ph?] ______________, they did use a board. Sandra Schermerhorn: Boards for that one. Did they have tournaments? Interpreter: No, at the beginning, no, it's not enough people. Interpreter: The Late Kwan Jang Nim didn't believe in tournaments. I believe that still we don't have a tournament. We have a martial festival, where you can demonstrate the Chok Pa and other area in ________________. So I don't see this as a tournament. I see this as art festival. Interpreter: The tournament or competition, I believe there cannot be a competition is because competition means somebody lose, somebody wins. In our art, we are all winner. So therefore we cannot be a competition. Somebody has to die, somebody has to alive. So the art is not about that killing or winning. So the Late Kwan Jang Nim never use the tournament or competition. He always use Chung Yun Da we [ph?]. Chung Yun Da we means art festival. Sandra Schermerhorn: I see. All right, can he tell me what other people's attitude was about martial arts? Interpreter: About Moo Duk Kwan or just martial art? Interpreter: Those days, early days we have _______________ now in Moo Duk Kwan and other start is Orso [ph?] is smaller numbers. Because very few people trained, public were not aware, because those trainings were pretty secluded. It's not a secret but it's not well known then to the public, so public wasn't aware. But if the public knew, only few people knew that the training martial art, the martial art people who trained the martial art, that it's very strong or powerful, be, you know, not afraid but respected, that they knew something. Sandra Schermerhorn: How long did he actively train in the martial arts? Interpreter: I was teaching at a Chin He [ph?] until 1984. It doesn't mean that I stopped a Moo Duk Kwan life. My Moo Duk Kwan life continues. So I still practice in Moo Duk Kwan. Sandra Schermerhorn: All right, what is his favorite thing to do? Like did he like sparring, did he like forms? What did he like as a person training? Interpreter: My favorite training is the multiple sparring, or the multiple special sparring with the tan do [ph?] weapon. That's what the Late Kwan Jang Nim asking to practice a lot. So he did– I did demonstrate many times the multiple sparring and multiple weapon, self defense. Sandra Schermerhorn: If he would give us some advice about the multiple sparring, what would he like to say? Interpreter: I don't know. I mean I'm sure there's unlimited way to tell you or the practitioner. It's hard to say, you know, it's hard to tell you what advice I would give to you. Interpreter: Actually, we didn't have a dan system first, as you know. The Late Kwan Jang Nim didn't wear dan belt until later, but the early days we used to go to the mountain and certain skills we mastered, takes five or six years, or whatever, and we come down, you know, and we teach or demonstrate. So that's the way that we used to train in the early days, talking about two, three people at a group. So the master goes, takes a couple disciples and train your certain skills and then master approves. In this case, the Late Kwan Jang Nim would go okay, you can demonstrate. Sandra Schermerhorn: Was it considered like a better place to train in the mountains than in the buildings in town? Interpreter: I believe there is difference between training in mountain, or nature, or in the city. In the city it's easy to get distracted, and the towns are divided. So it's much more effective to train in the mountain is because it's almost like one in one situation. So you can really concentrate on certain training and less distraction. So I believe that training in the nature is much more effective. Interpreter: I did that for four years. I wish I did it one more year but there's Korean War broke out and unfortunately had to stop that. He regrets that he didn't do long enough because of the Korean War. Interpreter: I was some time almost losing my mind, thinking about my training, and if trained properly you don't have to actually go contact the person. Actually the person comes to your hand or foot, they hit. That's how the good training will do because if you don't train hard enough or effectively, you have to go out, reach out to punch instead of the person comes to you, to your hand, or your foot, your kick. That's how your body has to be fluent. You have to be free and by the time you have to block and contact it's too late. So when I was training it's almost like I don't have to look where the technique is coming. Automatically my hand will move, or my foot, body will move away without looking, that you will become like that if you train severely, severely, certain basic techniques or certain techniques for a long time. So you would gain awareness. Interpreter: When you spar, the chisan [ph?] becomes very important because in the beginning you want, intend to use very physical talents. But as you go higher, more advanced, it's eye to eye combat. So when you see your opponent's eyes, you know what techniques he or she might use, which direction they're going to move. So you can detect, you can see their motion to come in the eyes, and then same time you have to learn how to breathe carefully, because you can detect when they're going to move and how they're going to move by listening to their breathing. So it's good to confuse your opponent by various breathing technique, and there's different angle posture or distance. It is good to confuse your opponents, and so the opponent cannot detect you. Sandra Schermerhorn: I have not ever heard of that, the breathing. Interpreter: When you get hit, why you inhale is much more different than when you hit, contact, when you exhale. Sandra Schermerhorn: You know, I hear the eye to eye, you know, but I even don't think about listening to the breathing, you know. It's good. Interpreter: Let's don't go into detail but somehow if the talent, the skill is too different between person A and B, the person has less skill try to maneuver the techniques to the senior rank or much higher skill, it doesn't work that way no matter how. And versus the high skill person can control the lower skill person easy as it is, and that is the nature. Interpreter: Let's do the other things. Sandra Schermerhorn: Okay, when he was training, he's trained a long time, what changes has he seen over the years in the training, the number of people? Interpreter: Oh it is a lot. Interpreter: The biggest things happened in Moo Duk Kwan life is the Korean War and that was devastating, not only my life change but social changes. Sandra Schermerhorn: Did he live, for the Korean War, did he live in Seoul? Interpreter: Yes, I lived in Seoul during the Korean War. Sandra Schermerhorn: That was kind of a dangerous place? Interpreter: Of course it was very dangerous, life threatening. Interpreter: When the Korean War broke we didn't have time to pack or anything. So what I remember was I ran out with underwear and t-shirts ______________. Sandra Schermerhorn: And how long was it bad in Seoul? Interpreter: When the Korean War broke, actually it broke June 25, actually the North Korean came and attacked us in Seoul June 28th. That's when I escaped and ran out to the near mountain. Sandra Schermerhorn: Oh, he went up to the mountain. Oh, and he trained before the Korean War stopped, then later? Interpreter: Of course I did. Interpreter: Because the Korean War broke and Moo Duk Kwan was all dismissed, and it was lost, and it start back a year and a half later, we met and continued on. Interpreter: During the war, it depends on the situation of the war. The Late Kwan Jang Nim also has to move around to himself _______________ like that and that's when we had a Moo Duk Kwan _________________. Sandra Schermerhorn: Were you in Pusan too? Did you go to Pusan? Sandra Schermerhorn: You did too. Interpreter: The current ___________________ was five years old. Sandra Schermerhorn: A little boy. How about, were there dan testings in Korea? Interpreter: Of course we had. Sandra Schermerhorn: What were they like? You know how ours were a day or a couple hours. Interpreter: In the beginning because a few of us, it only took a few hours, but I remember the biggest event at that time in Pusan, almost 500 people were applying for dan Shin Sa [ph?] and that took a long, long time. There was a very, very, one of the biggest growing period at that time was when we had over 500 people, candidates were applying for dan Shin Sa. Sandra Schermerhorn: Does he recall when that was? Interpreter: That was just before 1960, the coup-de-tat. So it must be 1959. Sandra Schermerhorn: So he saw the Moo Duk Kwan go from three or four people training up to 500 people testing then? 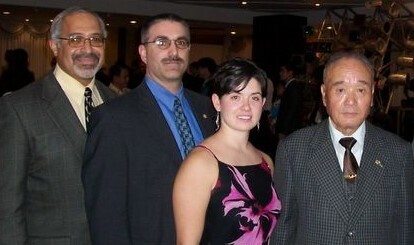 L-R: Master Bonefont, Allen Ruqus SBN, Master Rachel Schepperly, from Region 2 USA, and Jin Tae Hwang Sa Bom Nim, meeting for the first time during the 60th Anniversary in Korea, 2005. Interpreter: So I was then when the 500 people were testing, I was the Shin Sa board. Sandra Schermerhorn: Oh, I see. So did he have a school then? Interpreter: That's in the naval academy I was teaching. Interpreter: This is the naval academy rank. Interpreter: And in 1983 he stopped teaching. Sandra Schermerhorn: Oh, I see. That's a treasure. That's a very special– can you tell me a little bit about the schools that he's taught at, that he had? Interpreter: Because they were only there for four years, it was difficult to teach them longer period. So my responsibility to teach is only for four years so that ______________ some people stay a little longer, they didn't go beyond Hi Dan [ph?]. Sandra Schermerhorn: Does he have a <inaudible> with any of his former students? Interpreter: Many, many of my disciples live in Seoul. Interpreter: Now, I know they live in Seoul but they're over 70 years old. So, but I know they are there and many people get together, but I am in Chinhae, it's much, much south of Korea. Sandra Schermerhorn: About how far away from that is Seoul? Interpreter: It takes about five to six hours. Sandra Schermerhorn: Oh, far. That's far. Interpreter: In Korea, they each like a school especially naval academy, my disciples have certain class championship. They have a, like a graduate '62, they have more like a union, like class campus union and they have contact. They have ________________. So if I contact one person, so everybody shows up. So it's easy to find my disciples in Korea. Sandra Schermerhorn: Oh, good. Yay. Oh, about dan testing, does he have any favorite memories about getting ready for dan testing? Interpreter: The Late Kwan Jang Nim never gave me good scores. He just give me enough for me to just work harder, harder, gives about 70 to 80, just enough to pass. So that next meeting to work harder and the Late Kwan Jang Nim always, always gave me something to work on. So that's hard but sometime it's disappointing but I know Late Kwan Jang Nim intention. I think he thought on my training it will last in my memory. Interpreter: I never could get 100%. Sandra Schermerhorn: He has a long history, long time in training. Does he have a best memory, something that made him feel good, very satisfying? Interpreter: The most enjoyable moment for me was when the Moo Duk Kwan was explained to the public, it was so dynamic period. The saddest memory of my life is when Taekwondo ______________ surpassed Moo Duk Kwan and we lost a ______________, the studio, we lost many schools, and some of them had to flee to different countries. 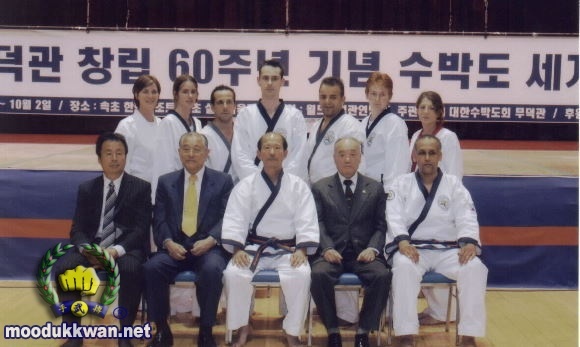 So that is not only Moo Duk Kwan's sad experience, it's my treasure too, also my personal in my career. Interpreter: If that didn't happen, if that Taekwondo ________________, the government didn't suppress Moo Duk Kwan, you can imagine how big, dynamic Moo Duk Kwan would be today. Ever since I see that, it's very unfortunate. 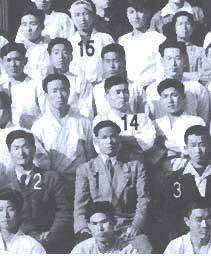 Interpreter: During the Korean War, all the head of the different organization was lost, and they went away. 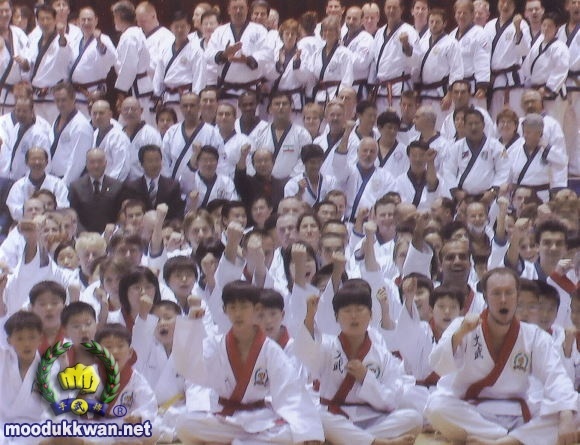 Only Moo Duk Kwan and Moo Duk Kwan, Kwan Jang Nim, stood as head of the Moo Duk Kwan organization and that's only organization that the founder, the founder saved the position and stood by the principle. Sandra Schermerhorn: Well, in talking about the founder, do you have a favorite time you spent, he and you together, or favorite story about him? Interpreter: I don't have my memory of certain way as you probably expect, because our Moo Duk Kwan, my Moo Duk Kwan life started with the late Kwan Jang Nim same place on the same house. I lived with him. So it's basically just no memories. The only memories at that time was to recover from the lost period. It just work, work, work, nothing but work to save Moo Duk Kwan and to reestablish the Moo Duk Kwan, and getting the late Kwan Jang Nim's fight to find disciples, and me try to support him, and the whole Moo Duk Kwan association at that time was vigorously trying to work hard to rebuild the Moo Duk Kwan System. And that, I think that is very, very hard work because of that. I would say that is my, the best memory of the late Kwan Jang Nim myself being together. Sandra Schermerhorn: Working hard, yeah. Do you have a photograph or remember a photograph that has special meaning? Interpreter: The Korean broke out, as I walk out there were, you know, underwear and shirt, we don't have a picture, and in those days we didn't have the technology, having cameras and any equipment to have pictures, just simply that's how the war effected in our life. It's really, really rare to have somebody has camera or things that we can photograph. Interpreter: I had so many books related to martial arts but I lost it all. Interpreter: When we got hit by the bomb, we had to lose everything. Interpreter: I have a lot of materials, as I repeat, I had a lot of reading materials gathered before the Korean War and it just so disappointed I couldn't save those books. Sandra Schermerhorn: If he could give some advice to practitioners now, what would he say to them? Interpreter: Only I wish to members, to the younger generation is to unify, everybody unifies under the current Kwan Jang Nim. Everybody must unify whether you're smarter, or less smart, or you're better or worse, everybody must unify to the one Moo Duk Kwan and support the current Kwan Jang Nim. And that will ensure our _____________ Moo Duk Kwan. Sandra Schermerhorn: Is there anything else you'd like to tell us, anything that he thinks we ought to know? Interpreter: I didn't prepare for this surprise, so now I don't have much to say. Maybe next time.